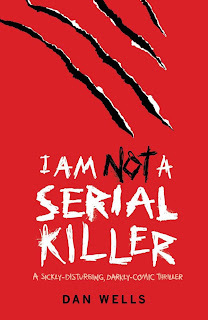 Today's feature is another creepy one: I Am Not A Serial Killer (John Cleaver trilogy, Book 1) by LDS author Dan Wells. When I first became aware of this book and its sequels (Mr. Monster & I Don't Want to Kill You), I was a little curious because the author is local so I read summaries and reviews, but I honestly didn't think I'd enjoy the books. I mean, "Serial Killer", just doesn't really appeal to me. These titles kept popping up though, and again, the fact that Dan is local and LDS kept pulling on me. So when Ally Condie, in a lecture at the Orem Library, mentioned that Dan Wells is a great writer and that she recommends his teen horror books, I totally gave in (see lecture post here). The library happened to have a sale book section, of which Dan's books were a part (Oh how convenient. And I knew this because I had hovered over them previously) so I bought the first book. I am so glad I did. Ally was right. Dan is a great writer. I was intrigued with the story page after page. It's psychological. It's parts of you and me. The main character, a 15 yr. old sociopath, is just masterfully created. And there's a demon. Because of this fact, the story was simply fantasy to me (or...what, paranormal? Can I not call it fantasy? Sometimes I just don't know what to call certain stories these days!). Anyway, the fact that the killer is a demon made it less...something that I wouldn't like. 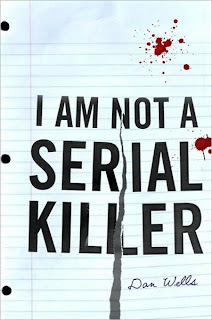 I don't know, I just think if it was a serial killer guy/human, it would have been a totally different read for me. But back to the main character and the writing. Just top stuff. Dan Wells makes John Wayne Cleaver so believable and strangely likeable. He is a completely cool character, very smart. He feels socially "out", but he's very human at the same time. I just don't know how to explain it. You'll have to read the book yourself to know what I mean (see, this is why I'm not very good at reviews -I just can't explain very well!). There was only one part in the story that disturbed me; where I thought John Cleaver went too far. I don't want to give anything away though. But even though there was that one part, I still agree with Ally that Dan's writing is good and I still want to read the other two books (I haven't yet, but I plan on it). So take all of this with a grain of salt, and give this book a try. Especially during this season of Halloween. It's perfect. Dead bodies are normal to John. He likes them, actually. They don’t demand or expect the empathy he’s unable to offer. Perhaps that’s what gives him the objectivity to recognize that there’s something different about the body the police have just found behind the Wash-n-Dry Laundromat---and to appreciate what that difference means.